In tribute to tomorrow's impending chemistry Nobel Prize, I thought I would repost a slightly updated list of predictions. Cons: This would definitely be a lifetime achievement award. Karplus did do the first MD simulation of a protein ever but that by itself wouldn’t command a Nobel Prize. The other question is regarding what field exactly the prize would honor. If it’s specifically applications to biochemistry, then Karplus alone would probably suffice. 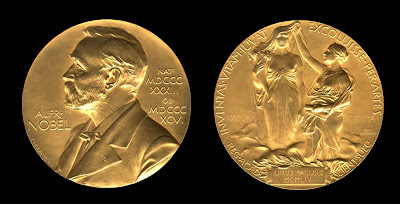 But if the prize is for computational methods and applications in general, then others would also have to be considered, most notably Allinger but perhaps also Ken Houk who has been foremost in applying such methods to organic chemistry. Another interesting candidate is David Baker whose program Rosetta has really produced some fantastic results in predicting protein structure and folding. It even spawned a cool game. But the field is probably too new for a prize and would have to be further validated by other people before it's recognized. Cons: Although electron transfer in biological systems is important, Gray and Bard's discoveries don't seem to have the ring of fundamental importance that, say, Marcus's electron transfer theory has, nor do they seem to be widely utilized by other chemists in the way that, say, palladium catalyzed reactions are. When the latest GPCR structure (the first one of a GPCR bound to a G protein) came out I remember remarking that Kobilka, Stevens and Palczewski are probably up for a prize sometime. Palczewski solved the first structure of rhodopsin and Stevens and Kobilka have been churning out structure after important structure over the last decade, including the first structure of an active receptor along with several medicinally important ones including the dopamine D3 and CXCR4 receptors. These feats are definitely technical tour de forces.